resulted in 129 people dead and more than 300 wounded. Six separate sites encountered guns, grenades, and suicide bombs. Residents world-wide are on renewed alert with increased terror threats in the United States, France, Italy, Germany, and many other countries. What authorities find most frightening about this incident is the fact that these attacks were performed primarily by Europeans who’d traveled to Syria to join and train with ISIS, and then returned home to carry out these deadly attacks. “This is the attack everyone was worried about, and it finally happened,” remarked Louis Capriolo, former deputy head of France’s domestic anti-terrorism unit. It is believed that 1,000 French citizens and 600 Germans have been drawn to fight with ISIS. The large amount of territory occupied by ISIS allows militants to come and train in both combat and bomb making. They can then return home and apply what they learned with little if any notice by authorities. One of the struggles intelligence officials face is not so much identifying who in their country represents the potential threat, but rather, whom to place under the tightest surveillance. In France alone there are believed to be about 3,000 people who could be a threat. 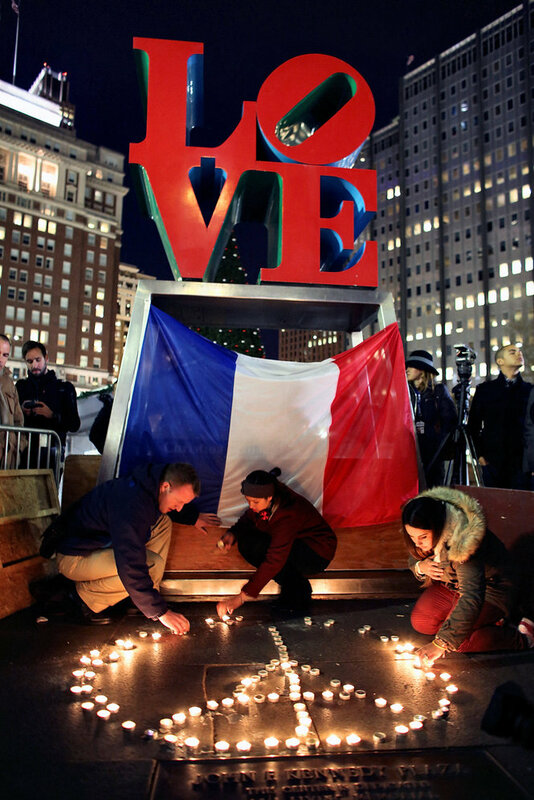 While nations struggle to find effective ways to prevent and combat terrorism, many have pledged solidarity with France. Monuments and landmarks worldwide were lit up in the blue, white and red colors of the French flag in the days and weeks that followed. Even individuals on social media sites joined in this show of solidarity. It’s true, the initial impact of this series of attacks temporarily stopped France in its tracks. President François Hollande declared three days of national mourning in which public transportation and institutions like schools, museums, libraries and food markets were closed. However, the residents of France refuse to allow fear to permanently halt their way of life. A call on twitter with hashtags #jesuisenterrace and #tousaubistrot sent residents out into the streets and café’s as is the normal past-time of Parisians. Vanessa Lucot, an architect at La Défense business district described the typical Parisian life. Only three days after the attacks crowds swelled into the streets again to enjoy life as normal. “With this simple act, we’re showing that we are never going to let the terrorists get at the heart of France,” remarked local resident, Maxence Lezeau.